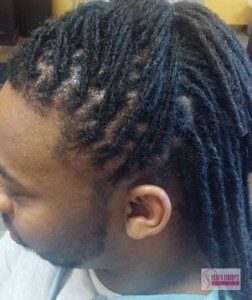 Have you considered getting dreadlocks in the Dallas and Grand Prairie, TX area? Make sure that you come by Beauty Concepts Salon to see one of our skilled lockticians. Whether you’re in the beginning stages of your lock journey or just in need of regular maintenance, we have everything you need! So call the best in the Dallas, TX area. You can reach us at 817-724-9059. Dreadlocks, also called locks or Jata (Hindi), are a natural style achieved by creating intentionally matted coils of hair. Locks may be worn in many ways, and include mini or large, rope-like tresses. Proper maintenance requires clients to receive hot oil treatments, deep conditioning, and other maintenance approximately twice a week. This will prevent the hair from looking dull or dirty. Regular routines such as tightening, palm rolling, drying, and waxing are also highly recommended. Keeping the scalp dry, clean, and moisturized is critical. This style normally takes approximately three to four hours depending on the client and the services needed. The process of dreadlocks is not something that comes overnight. This is a style that has to be maintained on a regular basis to thrive and become more and more healthy. So don’t be discouraged because there is hope for for your dreadlocks in Dallas and Grand Prairie, TX. Contact Beauty Concepts Salon at 817-724-9059 to schedule your appointment today. Updated on August 4, 2016 at 2:24 pm by Beauty Concepts Salon.